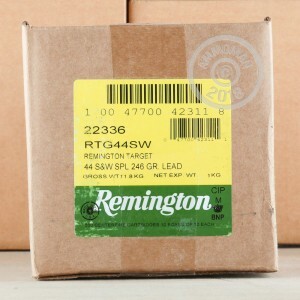 Remington's 246-grain target load for the .44 Special caliber has been around for a long time due to its versatility: it's safe for use in older pistols like the Smith & Wesson Triple Lock from the early 1900s and was a trusted round for self-protection before modern hollow points gained ground due the bare lead bullet's capacity for "squashing" during entry. The rounded nose of the lead bullet allows for easy insertion into swing-out cylinders as well as loading into the gate of a single-action revolver. 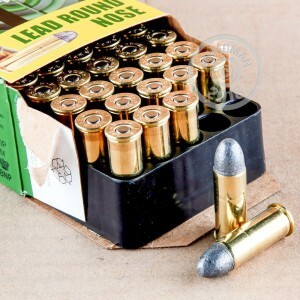 Each LRN bullet is crimped into a reloadable brass casing where it is supported at the base by a second crimp to prevent setback which could otherwise cause dud-fires or hurt accuracy. Expressly intended for target applications, these cartridges offer relatively soft recoil and generally flat trajectories out to 25 yards. 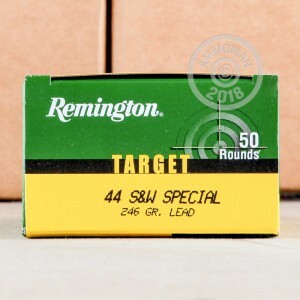 That makes these .44 S&W Special rounds a great choice for casual plinking or practice with a .44 Magnum revolver or lever-action rifle. Remington crafts their ammunition using over 200 years of manufacturing experience that gives them a distinct feel for shooters' needs.